Eclipse PHP Development Tools (PDT) 2.1 is now available from the Eclipse.org download site and from the Zend/PDT Community site (includes Eclipse PDT and Zend Debugger which enables users to perform local and remote debugging). The Eclipse PDT team would like to thank everyone who made this release possible. As always, our Eclipse PDT community has provided countless new features, bug fixes, documentation, etc. We'd also like to thank the Eclipse Dynamic Languages Toolkit team for cooperating and helping us with the new infrastructure. Fully compliant with Eclipse standards, the new 2.1 release enables PHP developers to leverage a wide variety of Eclipse projects, such as Web Tools Project (WTP) and Dynamic Language Toolkit (DLTK), for faster and easier development. PDT 2.1 also offers strong support for Object-Oriented Programming (OOP) in PHP. What's New in PDT 2.1? 270589 normal php6developer@ya.ru Core An internal error occurred during: "Selection Job titile". 246595 major me@ikravets.com PHP Explorer & Projects management Problem with saving files and etc. 250517 normal allanhughson@yahoo.com.au PHP Explorer & Projects management An internal error occurred during: "Building PHP projects"
254411 normal silviya@zend.com Editor [Regression] No syntax errors annotations for external files. 259750 normal andrey@niakhaichyk.org Release Engineer Project meta-data needs improvement. 259769 normal charles@etherscapes.com Editor Placing cursor on constant name like MY_CONSTANT brings up error dialog "'Selection Job titile' has encountered a problem"
266637 normal rmindorff1@cogeco.ca Debugger debugger stops at mysqli request. 275004 normal php6developer@ya.ru Code Assist Not work autocompletion for "is_*"
277137 normal php6developer@ya.ru Code Assist Replace code template for "method comment"
277466 normal eclipse@irolo.net PHP Explorer & Projects management PDT / DLTK Regression "Selection Job titile"
277762 major michal.bisco@gmail.com Editor Could not open the editor: Editor could not be initialized. 278386 normal ch@lathspell.de Code Assist Code completion (ctrl+space) for abstract methods? 279388 normal mjs@beebo.org General UI Eclipse PDT reports itself as "EPP PHP Package"
The Eclipse and PHP communitites grow together. When one makes a change, the other takes a consequent action. When PHP announced it was going to deliver a new major version, Eclipse PHP Development Tools (PDT) reacted with an early that supports the new PHP 5.3 language features. There are many issues solved in this release, such as usability issues concerning the PHP Explorer, code assist improvements and mark occurrences fine tuning. Full list of resolved items can be reviewed here. What's New in PDT 2.0? PDT 2.0 was designed based on principles different to those of Eclipse PDT 1.0. For example, different techniques were used to model workspace projects. PDT 2.0 now uses an indexing and caching mechanism for improved performance and experience with code assist and navigation. Moreover, since PHP provides enhanced Object-Oriented features like inheritance and polymorphism, PDT 2.0 provides enhanced features such as type hierarchy, override indicators and type navigation for programmers who utilize these language properties. As previously mentioned, PDT 2.0 is based on the robust Eclipse framework for caching and indexing language elements, utilizing the proven mechanism used by the Eclipse Dynamic Languages Toolkit project. In addition, PDT 2.0 has a reduced list of dependencies which includes only those features that are a "must have" for PHP developers (so no more unnecessary Java or J2EE components in the tool). Of course, Eclipse provides an easy way to add extra plug-ins as required. The Mark Occurrences feature enables users to see where an element is referenced by simply clicking on the element in the editor. 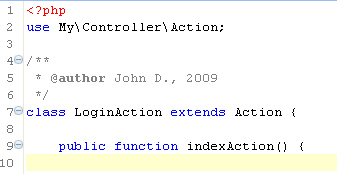 When the Mark Occurrences feature is enabled, all occurrences of the element within the active file will be highlighted, and indicators will be displayed in the annotations bar (to the right of the editor). 'Read' and 'write' occurrences are marked in different colors. 'Override Indicators' are markers that display special decoration icons to indicate methods that override or implement other methods from a super-type's class / interface. The override indicators will be displayed as triangles in the marker bar (the vertical ruler to the left of the editor) next to the method's definition. Green triangles indicate an overridden method, while white triangles indicate an implemented method. Hovering over a triangle displays a tool-tip that reveals the overridden or implemented method's super-type. The Type Hierarchy view is exceptionally useful for viewing and navigating OO PHP code. There are three presentation formats available through this view: the Type Hierarchy, the Supertype Hierarchy, and the Subtype Hierarchy. These three presentation formats revolve around a focal point type, indicated by the label decoration, which is the type on which the view was opened. When viewing classes, the view displays the class hierarchy from the object through to all of the class and subclasses. When viewing interfaces, the view displays all classes that implement the interface and their subtypes. When viewing supertypes, the view displays classes that are extended and interfaces that are implemented. When viewing subtypes, the view displays a class and its subclasses or an interface and the classes that implement it. Any method or type in the workspace can be opened using the Open Type wizard or the Open Method wizard. The Open Type/Method dialog maintains a history of recently opened elements. These are shown when the dialog is opened and stay above a separator line when filter expressions are typed. PDT 2.0 introduces a new code assist mechanism. This new mechanism is smarter as it crawls through code to determine variable types, providing more appropriate suggestions than those provided in PDT 1.0. PDT 2.0, code assist also supports camel case matches when entering code, which displays code assist options based on an element's initials. In addition, code assist supports options for 'magic members'. These are properties and methods which were declared using the @property or @method tags within PHP DocBlock comments rather than in the PHP script itself.